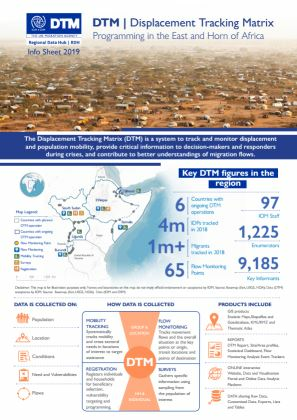 DTM Regional office, has supported the establishment of a network of 65 Flow Monitoring points along the three main migration corridors in the Region (see map above) in Djibouti (11), Ethiopia (5), Somalia (7), South Sudan (19), Uganda (15) and Burundi (8). Flow monitoring provides quantitative estimates of the flow of individuals through specific locations and informs about the profiles, travel history, intentions and needs of people on the move. In the region, this system also supports preparedness and response in public health emergencies by providing mapping and information on population movements in Uganda and in South Sudan, specifically in relation to the recent Ebola outbreak in the Democratic Republic of Congo.